When it comes to conventions and expos I’m still a newcomer to the scene. The only one that I’ve been to regularly is the UK Board Games Expo that is held every year in Birmingham. So when I heard about a local comic con near me, I made it my mission to go and lend my support. 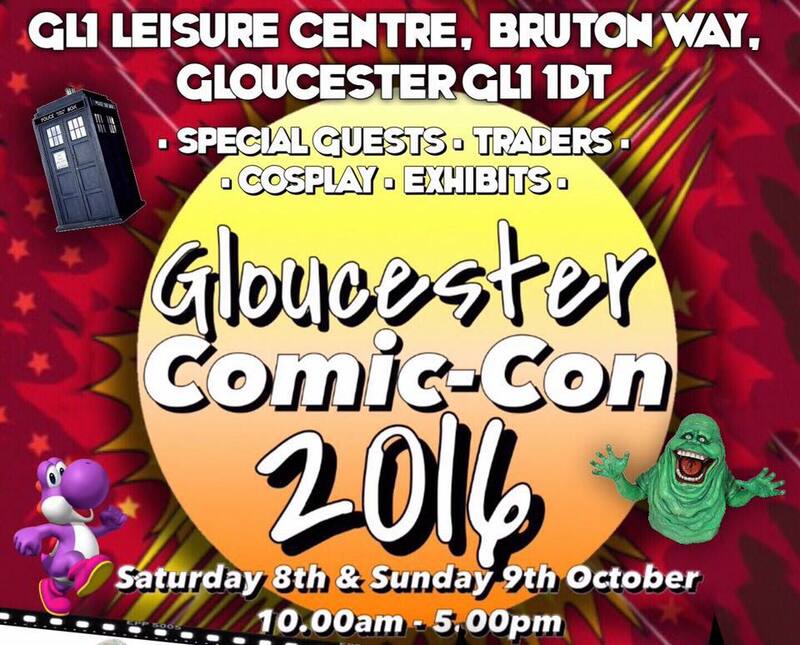 The Gloucester Comic Con is relatively new to Gloucester, this being there first event held in the city (to my knowledge), so if that is the case then they did well. Back in the day attending a comic con was the type of activity that only die-hard people would attend, resulting in a small meeting room with a few tables of merchandise and comics. However, this was not the case for the Gloucester Comic Con. The cosplay element is what I think makes it, more so than the famous guests, their talks or even the merchandise. I feel that the participants of the cosplay are the atmosphere, the element that brings it alive. You have a group of people who want to showcase their love for the genre to strangers. The dedication and love that goes into the costumes is immense and it must be a real buzz for people to come up to you and interact. Imagine the joy when a young kid sees their favourite character, whether it’s from Dragonball Z, Flash, Pokemon (Yes, I’m looking at you Team Rocket family). I admit that I wasn’t too familiar with the Anime side of cosplay but it was good to recognise characters from several type types of media. Ash Ketchum (several), Misty, Team Rocket, Flash (Yellow, Red), QuickSilver, Harley Quinn (Jester and Suicide Squad), Batman, Several Deadpools, Zatanna, Rainbow Dash, Supergirl/Woman, Enchantress, Captain America, Assasin’s Creed (Apparently Conner), Poison Ivy’s, American Mcgrees Alice, Goku, Spidermen (costumed and the Andrew Garfield version), Mini Boba Fett, Thor, Snow Storm Trooper, Loki, Jokers, Riddler, BSG Apollo Pilots (Tan jacket, white trousers with black banding), Red Hood, Bane, Scarecrow. I’m sure there was some Daenerys, elf women and others. I hope that in the future, they bring in “famous” cosplay guests and hold workshops. I think that would be very popular. The point being is that there was a mixture of ‘geek interests’ that resulted in people mingling and making friends with each other. This is the type of networking that will happen in Gloucester and make the event bigger and better. As I’ve seen with other cons, the cosplay will explode and be a huge thing on its own. From a personal point, maybe I should try next year and go as a character (Always wanted to do Bishop or Blade). Next year, I’ll approach more people and do video interviews with the cosplayers. Find out more about them and their character. Maybe interview them as their character. It’s always worth a try. So to all the cosplayers out there, well done and keep on being creative. I wish I could recognise every one of you and your costume. I’m not THAT good at knowing characters. By the way, who won the cosplay competition on both days? The special guest element of the con is always a good thing to provide. It is a surreal experience knowing that the person that you’ve seen on television is a mere couple of yards away from you. You have the opportunity to speak to your favourite actor. I’m not the sort of person that seeks out autographs but it was clear from the various lines that every star had their respective fans. It must be a long day for them, meeting people and doing talks. It’ll be interesting to see who will come in the following years as the con gets bigger and bigger. For the people that attended the talks, how were they? Was it easy to hear them over the ‘noise’ of the main hall or would it be better to have it away more isloated? And it’s only now that I realised that Sophie Aldred is the voice of Tree Fu Tom. Huh, you live and learn. For the space that was available for stalls to use, there was a surprising amount of merchandise to buy, ranging from trinkets, card games, clothing, artwork commissions. The prices did not seem too expensive and I felt that the range of stuff to buy was well represented. Some stalls had lucky dips and games for kids to try out. That makes it more interesting for them considering that some other elements of the con must be a little boring for them. I know my kids wouldn’t know 99% of the stars in attendance, except for Sophie Aldred who I just realised does is Tom Fu Tom (you learn something new every day). I brought ‘Resistance in Motion’, the X-Wings skimming over the water by sm-artworks.co.uk – It’s going to hang nicely in my living room. What did they do well? They organised a con in Gloucester, which to me is huge. It’s nice not having to travel miles to go to a decent convention. It seemed that the need for a con in Gloucester is a much needed one and from feedback on Facebook, people are clambering to attend the next one. The cost of attending was a good price point. When you consider the size of the event plus the fact that you could meet television and movie stars for the price (whose attending fees are probably not that cheap), then I feel that you get good value. Everyone seemed to have fun interacting and I’m sure that many friends have been made. Good lighting, space and atmosphere. The queue (At least) for me was not too long and organised well. I was thinking that there would be a huge queue outside the building (I did go on the Sunday, so Saturday may have been different). So what could be improved? At the current point in time, the con is small enough that you don’t need a detailed map of where the vendors are. However, as it does get bigger and bigger, a brochure or leaflet will be handy for people to quickly locate a stall that interests them. Leaflets handed out to attendees that highlight when the talks are to be scheduled. I know that there were leaflets on the wall but it maybe and I’m sure for some people, very easy to miss it. For me personally, I felt that signage OUTSIDE the venue could have been better. The parking at GL1 isn’t the greatest and I had to message the event to find the best place to park. I believe that for next year, they should put on the Facebook page, places that are easy to park at. It can be confusing to people that do not have a great knowledge of Gloucester. For the stall owners, maybe they should have a space in a brochure or leaflet that showcases what they do and any social links just in case, people want to have a look at the merchandise after the event. Posted in Event and tagged Cosplay, Gloucester Comic Con 2016. Bookmark the permalink.